This attractive, brown-brick building was erected in 1923 and converted to a cooperative sixty years later. The 15-story edifice, which has only 38 apartments, has a nice top with a pleasant cornice above two bandcourses and an attractive three-story composition of white spandrels and window surrounds. The top of the building is a bit livelier than the base which has two bandcourses and white top lintels on the fourth floor windows. The building, which has an exposed rooftop watertank, has consistent fenestration, a doorman, and protruding air-conditioners, several of which cut into the handsome terracotta frieze on the third floor. The canopied entrance leads to a handsome, step-down lobby. It has no balconies and no garage. 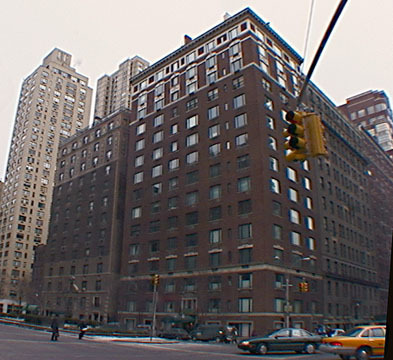 It was designed by Schwartz & Gross, an architectural firm whose other Park Avenue buildings include 470, 525, 885, 888, 910, 911, 930, 941, 983, 1070, 1095, 1125 and 1165. This building has one of the most convenient, albeit busy, locations on Park Avenue as it is very close to the express subway station on Lexington Avenue at 86th Street and there is excellent cross-town bus service is at the corner. This area at the southern end of the desirable Carnegie Hill neighborhood has many fine schools and religious institutions are nearby as well as supermarkets and many cultural institutions.